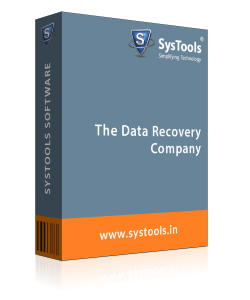 Software to recover lost data from damaged / corrupted VHD or VHDX files and to repair them. The Hyper-V Restore Tool helps to restore permanently deleted and formatted files from .vhd or .vhdx virtual drives. There is no file size limitation for recovering and repairing VHD / VHDX files. Hyper-V Retrieve software helps to restore the VHD data along with images, videos, etc. 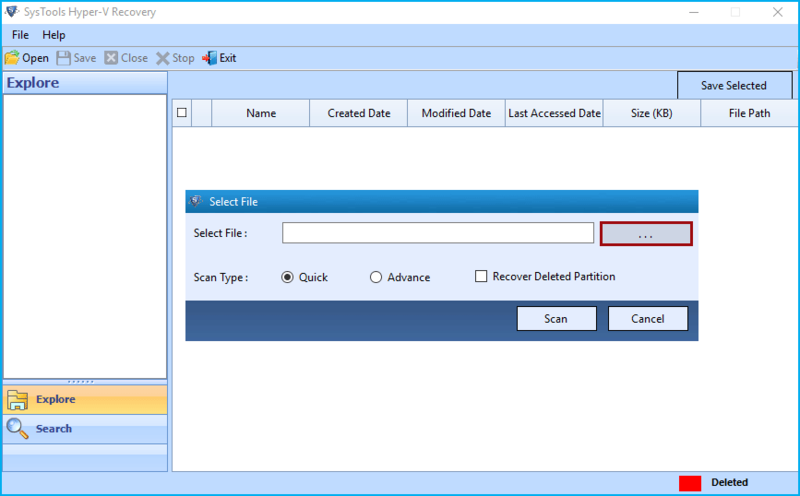 Also, this application offers advance scanning option that allows retrieving the files from empty recycle bin, folder, and partition saved in VHD data files. After scanning, need to preview the corrupt data instantly. 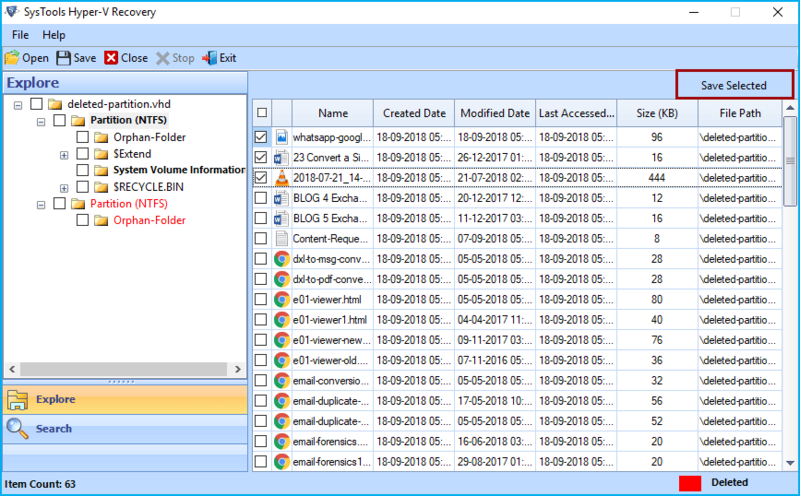 Once the user can see the emails, documents that found in VHD file then, the software will preview the selected files only. The software able to save the scanning report of partition. This advanced feature helps to save the time and provides the facility first, need to load scanned details of that particular partition whenever it requires being scanned again. The software provokes either user want to save the scanned data or not. If yes, then, the user able to save the scanned data for future reference. With the help of this tool, users allow to select the Recovery mode either Quick or Advance scan. Moreover, choose 'Quick Scan' for healthy VHD data files or even select 'Advance Scan' for corrupted or damaged VHD files. In case, if both the scanning mode become failed then one can go for Raw Scan option. This option is dealing with MBR corruption issue. After scanning completed, the tool gives the efficient searching data from scanned VHD files. 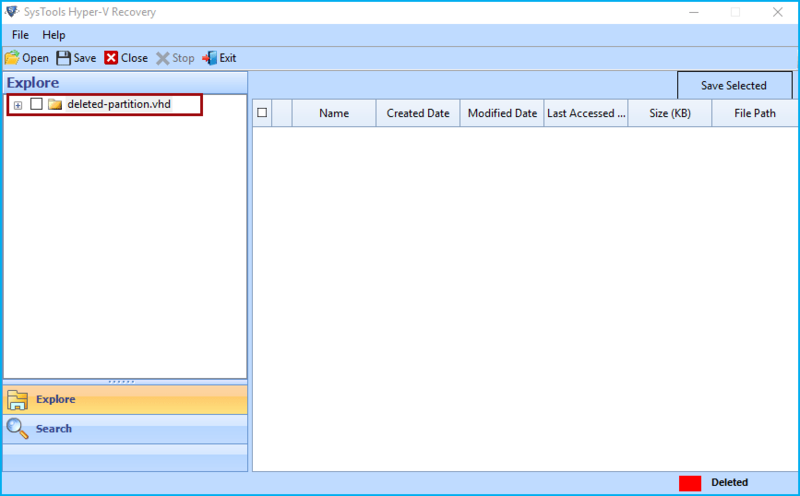 With this option, users can easily find out any particular data present in the VHD file. 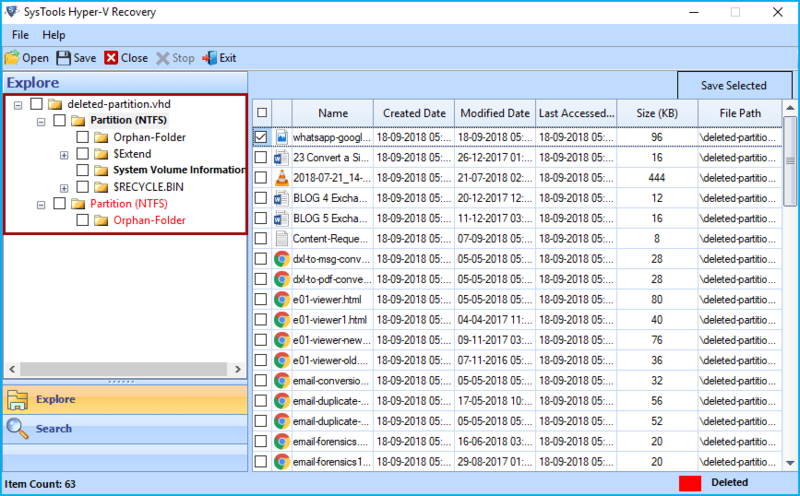 Users only need to enter the name of the file or the file extension and the tool will list all the items available in it that match to search option. Using Hyper-V Retrieve utility, users enable to restore the Dynamic and Static VHD data files. Windows Virtual PC recovery software assures that each data from the uncountable VHD files may be recovered at once. Only the healthy VHD files also can be recovered with VHD data recovery tool without installing the virtual environment. 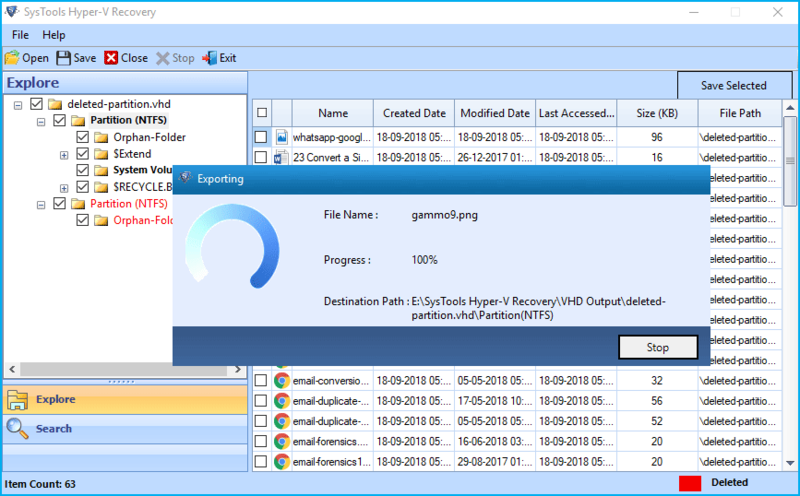 Moreover, this tool helps to repair VHD files safely from both FAT and NTFS partition. It will support 32-bit of NTFS & FAT for Dynamic and Fixed VHD data file. The Hyper-v Retrieve Tool permits a user to store output data at any specific location after completing the recovery of VHD files. Entire data will be saved with Metadata and retains the folder hierarchy completely. In addition, users able to check or uncheck the particular folder to save the selective files only. 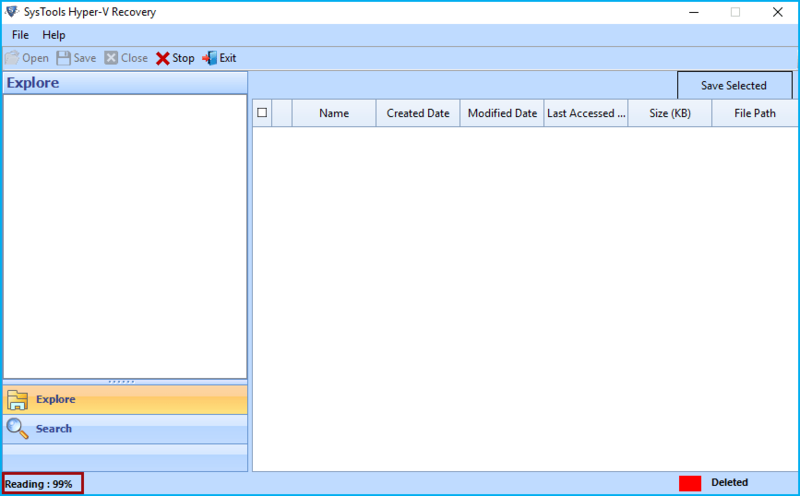 However, this tool will able to delete all possible errors and easily recover the Hyper-V data in a Well manner. 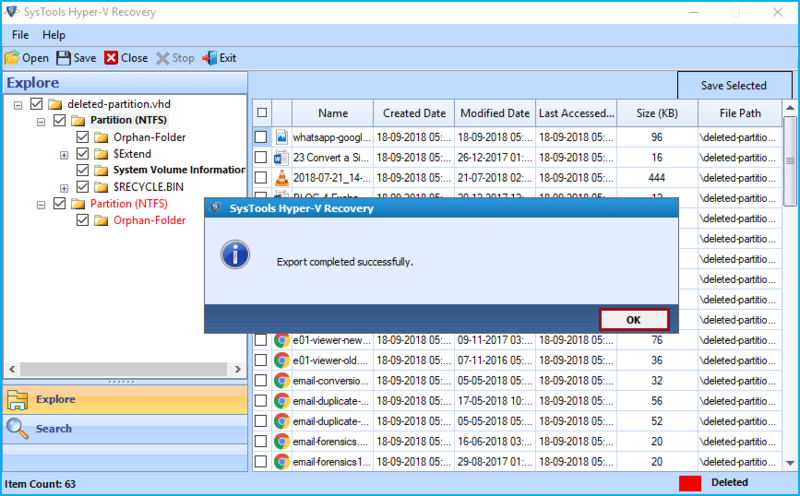 How to recover Hyper-V data files? Step 1 : Firstly Download, Hyper-V Recovery Tool and install it. Step 2 : Go to Open option, select VHD file or VHDX file and click on open it. Step 3 : Select either VHD or VHDX file from the folder. Choose the .vhdx file and press Open button. Step 4 : Or after choosing VHD from list, select the .vhd file and press Open button. Quick scan: Scan healthy VHD file. 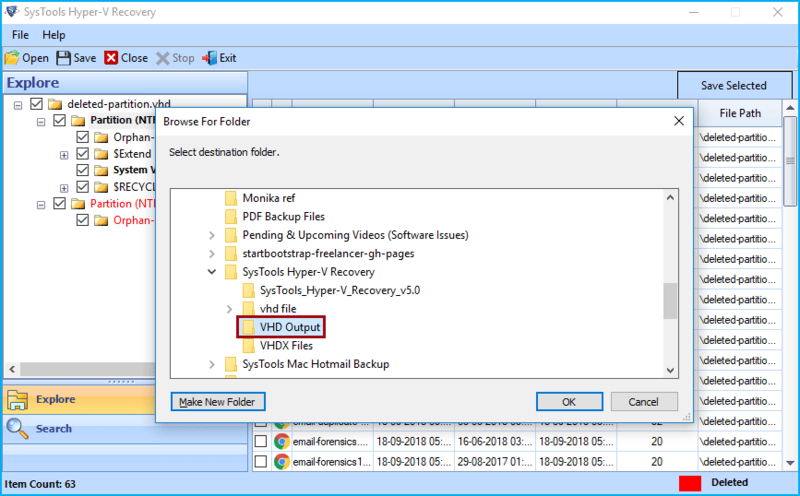 Recover Deleted Partition: Deleted partition recovery from .vhd or .vhdx file. Step 6 : The tool will show you the reading percentage. Wait till it reaches to 100%. Step 7 : Now the Hyper-v Restore tool will list the root folder in the explore panel. Open and view it. 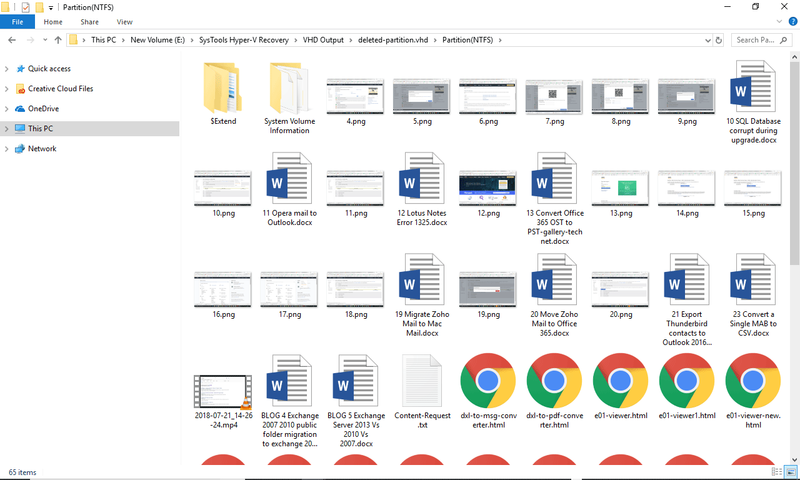 Step 8 : View all recovered folders and choose one of them and view complete data in the right-side of the window. The software also provides the preview of deleted partition in red colour. Step 9 : Now Save the data in the desired location. The application also provides an option to save Selected files. Step 10 : Browse and select a esired location to save the recovered fies effectively. The software also provide option to make folder in the desired location. Step 11 : The Hyper-v recovery software start exporting recovered vhdx or vhd files to the destination location selected. View the exporting process in percentage. Step 12 : When Export process is completed, click Ok on the messge box appears. 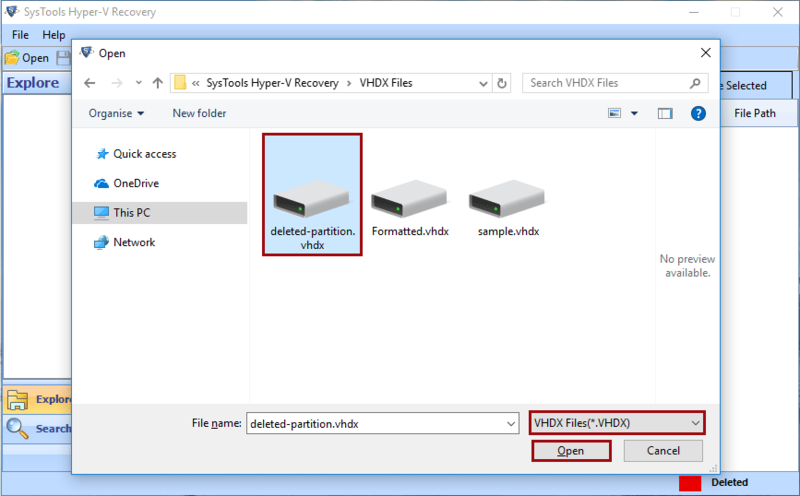 Step 13 : Go to selected destination location to open the saved resultant file and view the recovered VHDX or VHD files. Q. 1. Is It possible to retrieve data from the corrupted/inaccessible VHD Files? Ans: Yes, this Hyper-V Retrieve Tool only restores the corrupted or inaccessible data from VHD files. In fact, it cannot repair a VHD data items. Q. 2. 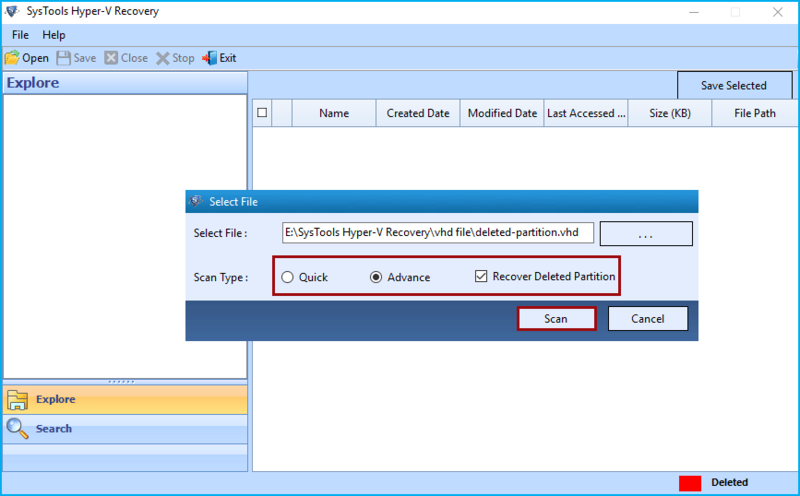 Does Hyper-V Data Recovery software support Dynamic VHD files for restoring? Ans: Hyper-V Data Recovery supports 32-bit of NTFS and FTS file system. In any case, if users trying to operate Dynamic VHD files of FAT 16 and 12 then, the software unable to support them and may be failed. Note: Hyper-V Recovery Software will get delivered on your registered email id, within few minutes after placing the order. I was looking for a solution that might bring back my permanently deleted data from VHD file in any situation. But luckily I have got this Hyper-V Restore Tool that provides the convenience of performing so even without installing the need of Virtual Environment on the Computer system. Thanks a lot for providing us a wonderful solution to recover deleted .vhd files easily. Retrieving the formatted or re-formatted partition of VHD file was such a challenging task for me. But due to the availability of Hyper-V Repair Tool, which helps a lot for restoring any size of VHD data files. I heartily want to thank the software developers who had created this application with the negligible amount of technicalities.